This is an interesting one. Seems kind of funny that one would spend almost $2K on a mountain bike for a type of frame/wheels that is known for it's superior handling in rough terrain and only ride it on the road? Why not just buy a cross bike? If you need a little a squish upfront, just hit up NYCBikes for one of their 700c fork deals. I wouldn't mind putting that Rock Shox fork for $99 on the Fixation to give the front just a little squish. The frame size could really be an issue, 19 inch is a little small for someone over 6' 2". Just look at me, I am not comfortable unless I am stretched out and all my bike frames (that I have purchased) are 20 inches and over. 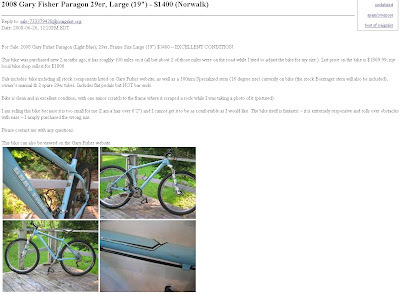 Sounds like the guy is really a roadie, went into his LBS looking for something off road because everyone knows the only cool riders are mountain bikers, the LBS pushed this onto him, he scratched it up on rock, and now has buyer's remorse - thus offered up on the CList.